We take a look at some of the big stories from the newest issue of CE Pro. 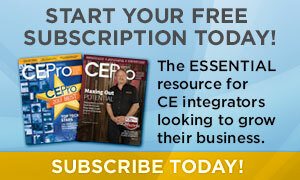 June 2009 CE Pro is out and available online. If you haven’t gotten the issue yet, you can view the digital issue here. We always welcome your comments on articles, but this is a chance to share some of our own thoughts. Frisco, Texas-based Theater Advice founder David Huse is a former Tweeter sale associate. I was glad to see he landed on his feet, parlaying some of what he learned at Tweeter into a pure custom electronics integration model. Huse says he has a 90 percent closing rate. That’s probably better than he ever had at Tweeter. I recently wrote a story that described the circumstances that led to Tweeter’s downfall. I heard from countless former Tweeter employees who haven’t been as fortunate as Huse. Many are still looking for work. Others have taken backward steps in their careers. The CE Pro 100 Brand Analysis reveals the product brands most used by CE Pro 100 companies. The companies at the top will be happy with the story, while the ones that don’t rank will not. Thanks to Robert Archer for arduously counting the brands indicated by CE Pro 100 companies and breaking them down into 34 category. Is Going Green Really Worth It? This particular headline really struck a chord with readers. The story was based on my visit with Cleantech, a Beverly, Mass.-based developer that focuses on building green homes. Founder Michel Reichert, a former banker and venture capitalist, says part of his company’s objective is to expand the customer base for green home technology. It’s a bit of a gamble, but he has a plan. Mr. LeBlanc must burn down rainforests in his spare time. Good line. For the record, I don’t. Cleantech is using an admittedly over-the-top show house to demonstrate the best of green home technology, but it will also offer tiered green solutions to homebuyers. 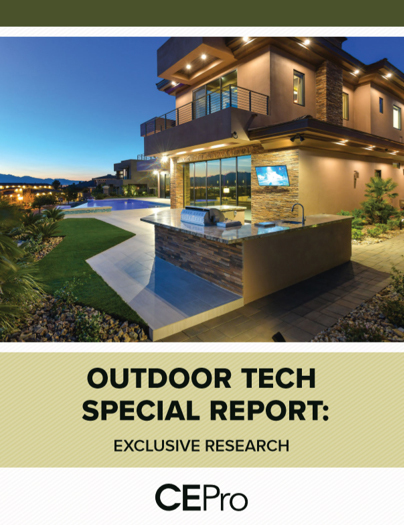 Reichert envisions homebuyers choosing between entry-level, mid-level and high-end green home system packages and making them understand their potential return on investment (ROI). Being able to monitor home energy usage via a control system is critical to reinforce ROI, Reichert says. Cleantech partners with two integration companies in order to offer home control and monitoring solutions. I hope Cleantech succeeds in broadening homebuyer demand for energy-efficient homes and home technology. It will be good for the environment and the economy. 21 Popular Freestanding Loudspeakers details the evolution of the freestanding speaker category, how manufacturers now seem to strive for style almost as much as sound quality. Manufacturers realize that neither men nor women want ugly speakers. Click here to view the slideshow. If your two passions are front projectors and spec charts, the Ultimate Guide to Front Projectors is for you. It includes prices and features for projectors from 19 manufacturers. Manufacturers are clearly revved up about the front projector category. Many talked about affordability compared to where prices were a few years ago. Many also referred to non-existent margins on flat-panel TVs. I got the sense that some manufacturers are banking on front-projection-based home theaters becoming more mainstream in the next few years. Check out the digital issue of June 2009 CE Pro.